As sure as the clocks going back at the end of October, what are the seasonal changes to schedules that airlines apply across their networks. Seasonal summer destinations get swapped out for more slippery winter locations whilst some services are quietly dropped, never to appear again. There are inevitably winners and losers but working out who they are can be complex; so, we’ve done it for you! In terms of net positions then London Gatwick appears to be the winner which might explain their sudden rush to convert a taxiway into a second runway. Some additional 1,490 frequencies amount to around 10-a-day which just happens to be more than the whole scheduled operating day at somewhere like Humberside. Gatwick’s disappointment at reduced frequencies to Moscow and Lagos is more than made up for by increases to Berlin, Doha, Copenhagen and St Petersburg all of which are scheduled for at least one daily frequency, if not more. Seemingly, much of Gatwick’s frequency growth comes from the various operating shades of Norwegian and easyJet although Qatar Airways are the largest true new entrant – except of course they are using BA slots! Edinburgh appears to be set for a strong winter, primarily benefitting from Ryanair adding some 1,242 flights to their programme with London Stansted, Berlin and, incredibly Derry the top three beneficiaries. Despite Flybe complaining about the quality of service at Edinburgh the airline has only dropped 12 frequencies this winter, all to Sumburgh which will hardly dent their latest profits warning. Edinburgh’s gain is inevitably Glasgow’s loss with the airport losing some 1,712 flights over the winter season’ again only around 11 a day but not a pattern to repeat too often. Over 850 of those flights were operated by Ryanair with “biggies” such as Gdansk Lech Walesa, Nowy Dwor Mazowiecki and, of course, Derry where Loganair are stepping in to replace Ireland’s friendliest airline. Subtle operating changes at Luton mean that Wizzair UK are adding some 2,646 frequencies whilst Wizzair are dropping some 1,213 frequencies. That’s a net increase of 1,413 services whizzing off to such famous destinations as Athens, Lisbon, Tirgu Mures and Poprad. 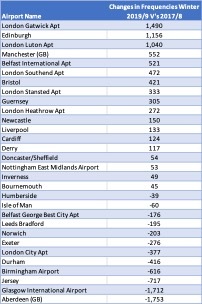 The two jewels in the crown of Regional and City Airports, Exeter and Norwich in case you were wondering, are both net losers in the Winter schedule changes compared to last year. For Norwich, the delight of a once-weekly scheduled/charter service to Burgas is perhaps comforting compared to losing 186 frequencies to Aberdeen with BMi regional. For Exeter, the loss of 249 Flybe services to Jersey and Guernsey will have been softened by a one-off service to Ibiza from TUI Airways. And finally, spare a thought for Birmingham where 909 fewer scheduled flights are expected this winter. FlyBe is dropping 200 frequencies to Guernsey and Toulouse while BMi regional is following closely behind with 188 fewer frequencies to key destinations such as Goteborg and Graz. Fortunately, new services from carriers such as Jet2 and Tui Airways to destinations such as Bodrum, U-Tapao and Kochi will reduce some of the pain from those losses. In summary, darker mornings and earlier evenings provide a great chance to adjust the schedules in line with either current performance or future market expectations. The continued growth at London Gatwick, Edinburgh and London Luton repeats a trend that has been developing over the last few years whilst Aberdeen, Glasgow, Jersey and Birmingham will hope this winter’s changes are a blip rather than a trend.